The French may not be as 'sporty' as Americans and northern Europeans, but they seem as likely as the rest to use the new year as a catalyst for getting one's body and physical fitness in order (like one tries do with one's living spaces too, see my previous post, Faire le ménage). Despite the worldwide attention that rich, delicious French cuisine gets, and the popularity of books that tell us that French women don't get fat, obesity is in fact a growing healthcare problem here as it is elsewhere in the West. A recent interview in Paris Match with the Health minister Marisol Touraine highlights this fact (Chavelet, Nov. 12 2012. "Marisol Touraine fait monter la température." Paris Match ) as does the revelation in the New York Times Magazine that weight-management company Jenny Craig is alive and well in France (see Dominus, June 2012. "French Women Worry About Getting Fat, Too, The NY Times"). The French obesity rate is half of that in the U.S., but within France, it has doubled in about 15 years. This tells us that the French are no different than citoyens (citizens) of any other post-industrialized society where the standards of living are comfortable and most people eat enough, but where as a consequence of this 'plenty', the food choices and physical activity do not always balance each other out. Obesity is an epidemic health condition in well-to-do societies. The French get their taste for sugar early on. The normal gôuter (the small snack for kids after school) as I've seen it here in the south is often pain au chocolate (either a factory-made soft roll with chocolate which the grocery stores stock in large quantities, or if you're lucky, a fresh bakery-made flaky croissant with chocolate--it's small, but it's sweet). My own kids marvel at some of their classmates' obsessions with candy and soda, and the food young rugby and soccer players eat between and after matches at tournaments is astonishingly junky. It's a lot of sugar and carbohydrates and fat. The upside is that these foods are generally not made with high fructose corn syrup, like in the U.S. (even the soda tastes different here), but sugar isn't exactly good for you either, nor is the processing of natural ingredients into food products like Nutella (the hazelnut chocolate spread, which one of my sons really likes). 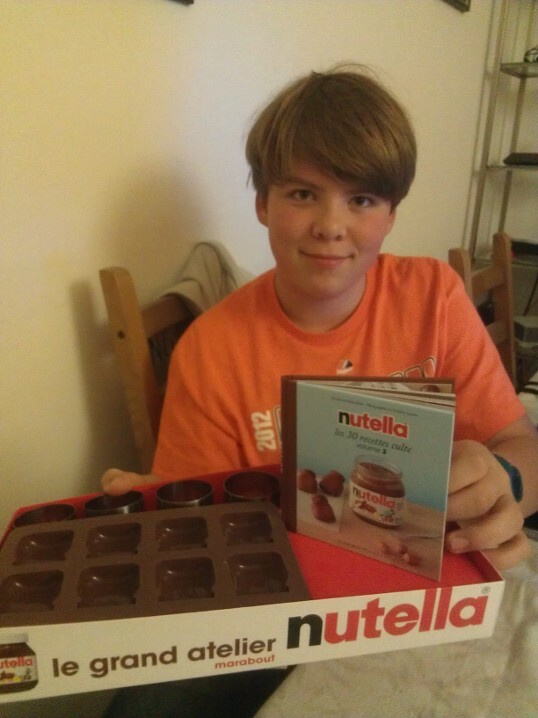 In November, the government began pursuing a Nutella-tax, on palm oil, as one way to reduce the consumption of saturated fat-laden foods in France. One response to the concerns about the deteriorating physical conditioning of the French is a public health campaign similar to the American Let's Move initiative led by U.S. First Lady Michelle Obama. The French version is called Manger Bouger and the goals are: bien manger (to eat healthfully) and bouger plus (to move more). Living in a relatively temperate climate in the south of France, it's easy to bouger, even though it took a while to discover where people exercise and what they do. This is not a country of large-scale, 24-hour health clubs as my spouse discovered (some are even closed on the weekends and evenings!). But if I get up early enough on a weekday, or take a late weekend afternoon walk, I see Aixois going for jogs or walks around town or in one larger city park with running trails. Every time we've gone for a swim, the lap lanes at the city pool near us have been crowded. More recently I've discovered the popular randonée (hiking). The parking lots at trailheads in Provence are frequently crowded in the afternoons and on the weekends, and there are people of all shapes and backgrounds hiking. 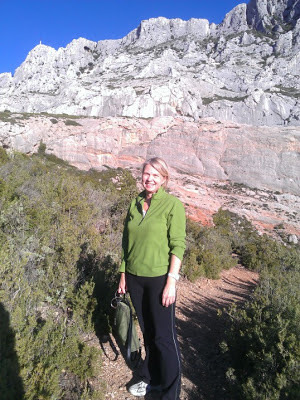 Numerous hiking clubs around the area also organize weekly or monthly hikes at the calanques on the coast or in the rocky fortresses and canyons further inland. 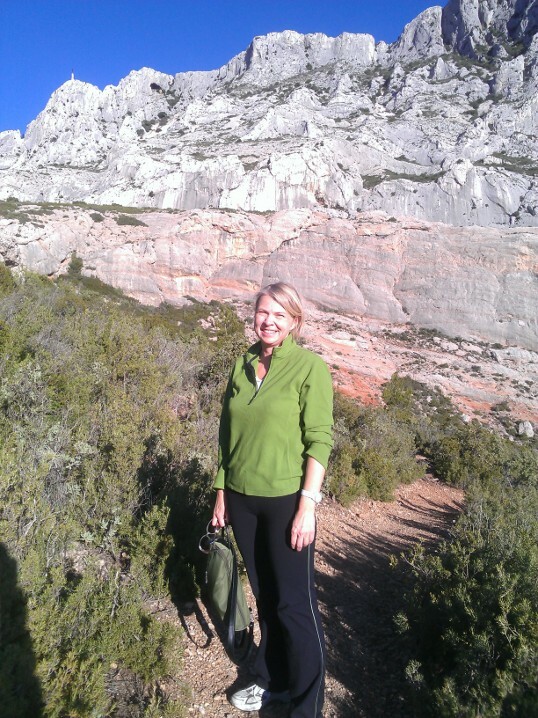 Luckily for me, a Finnish friend and I have formed a casual hiking club of two, and we have walked near the dams that supply drinking water in our area, and below, I'm pictured on a trail near the base of Aix's rocky Mount Sainte Victoire. It's only during the summer that hiking is difficult as the trails are opened for limited times due to the very dry conditions, the heat, and the fire danger. By that time, I suppose, we should all have mangé'd and bougé'd enough to get ourselves in shape for the beach or the pool, the only really comfortable places to hang out during the broiling summer months.